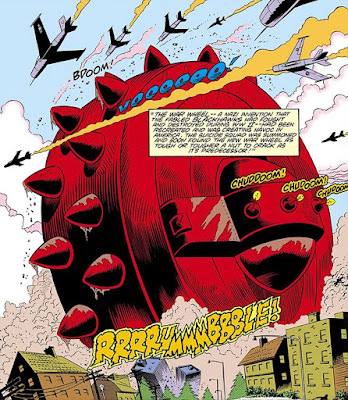 The War Wheel's spiked exterior is made to crush and roll over enemies. It does x6 damage to objects it is rolling over and with it's Reinforced Hull x6 it takes no damage from anything less than another ultra-heavy vehicle or objects (at the War Master's discretion.) It's crew take no damage in a collision unless the War Wheel is actually damaged in a collision. Due to its gyroscopic design and size the War Wheel ignores the Roll Over result. Roll again. If a raiding party manages to destroy the gyroscopic mechanism from within the War Wheel may fall on its side if the Roll Over result comes up. The dreadnaught is 150' in diameter and covered in massive spikes. It is incredibly armored and can survive artillery fire. It is vulnerable to bogging down in wetlands. 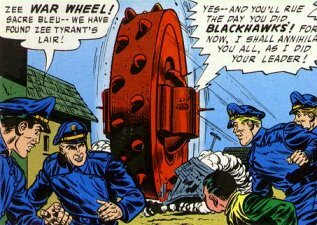 The first Wheel also had another flaw: electricity. If coming into contact with power lines or other major electrical source the crew will suffer 4d6 damage, Save for half. Later Wheels were insulated against this. If a squad can get on the Wheel and inside they can shoot their way through several levels of the goliath machine. Another adventure would be the Allies creating an ultra-damage weapon to do full damage and the squad having to bring it, position it, attack, etc.